Downtown Naperville's newest luxury apartment community. Completely finished! Move in now without any noisy ongoing construction. Located just steps from the Naperville Metra station and three blocks from downtown Naperville's dining and shopping district. Ellsworth Station features 39 luxury apartment homes in a brick four-story building with indoor parking on the ground level. 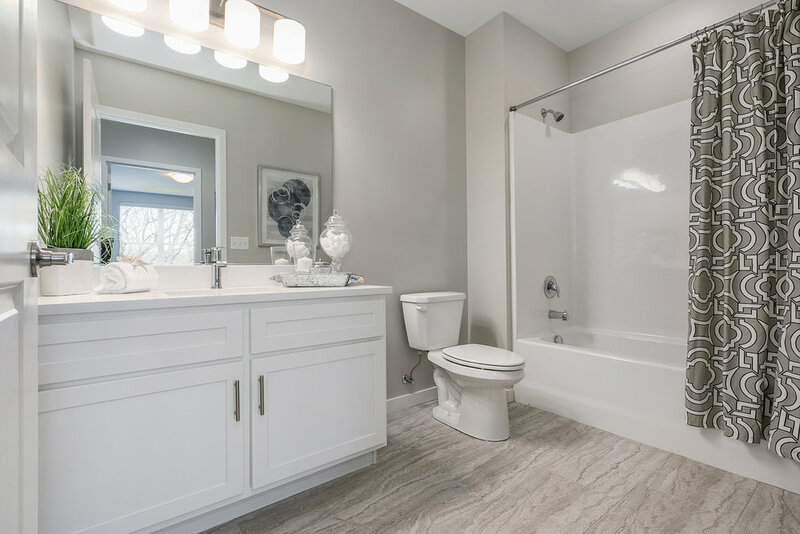 Get ready for modern, luxury living with large, open floor plans ideal for entertaining, and custom high end interior finishes in every room. A boutique gem bordering Naperville's historic district. 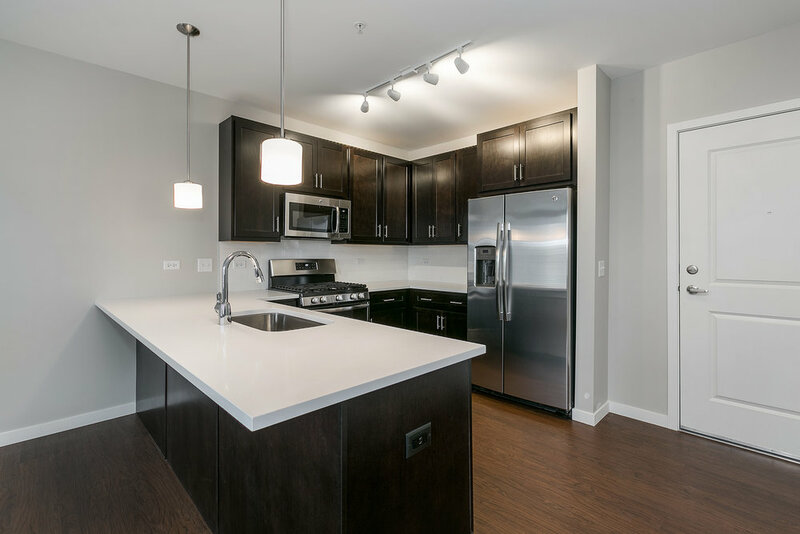 Ellsworth Station is downtown Naperville's newest luxury apartment community—the only one built in decades. Hop on the Metra for an easy commute to the city, just 30 minutes to Chicago via an express train. 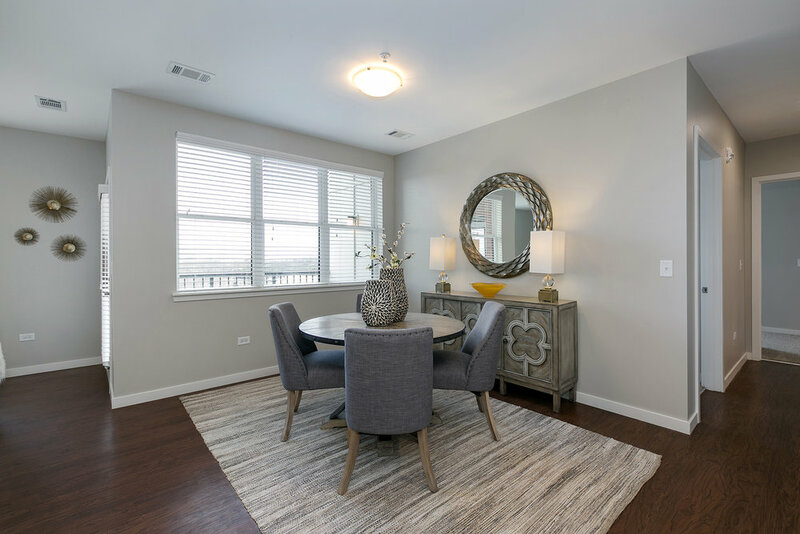 Across from quiet Burlington Square Park and is just a few blocks away from Naperville's nationally acclaimed District 203 schools and the DuPage Children's Museum. 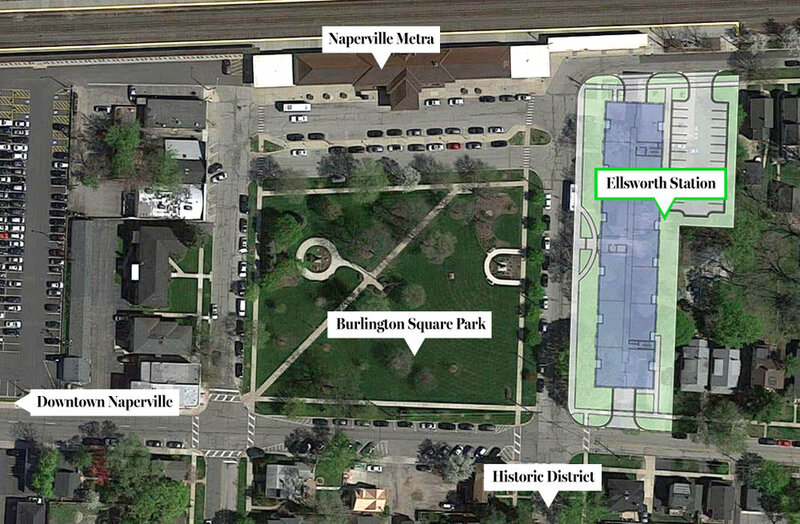 In this aerial view you can see where Ellsworth Station is in relation to Burlington Square Park, the Naperville Metra station, downtown Naperville and the Historic District. Many of the apartments overlook quiet and picturesque Burlington Square Park. Take advantage of the convenience of the Metra station right next door. Perfect for friends who want to visit, or if you want to jaunt to downtown Chicago. Your first look at Ellsworth Station. Ellsworth Station Luxury Apartments is now complete and our first residents are now moving in. You could be one of them. For more information, contact us. There are three TYPES of units available. Rental prices range from $1,995 to $3,500 per month. 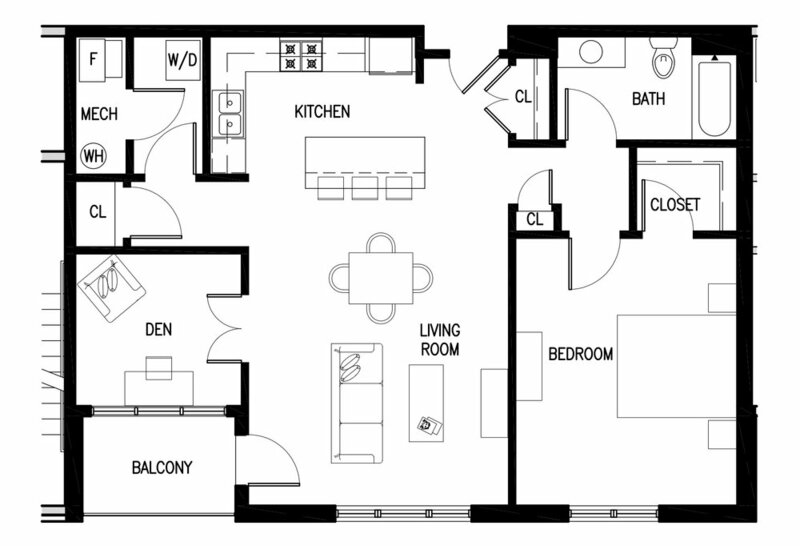 Unit B's have 1 bedroom, 1 study/den and are approximately 1,000 square feet. Rental prices start at $1,995 per month. 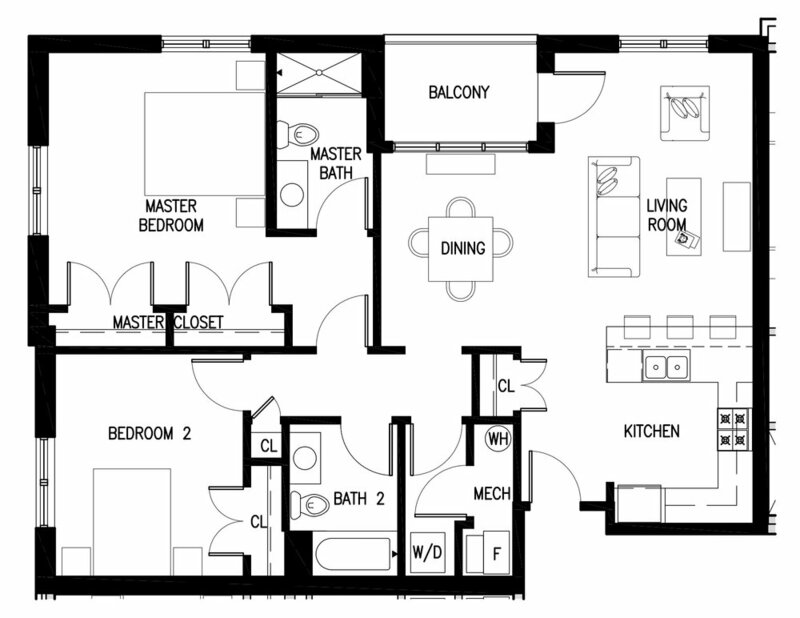 Unit C's have 2 bedrooms, 2 baths and are approximately 1,140 square feet. Rental prices start at $2,295 per month. 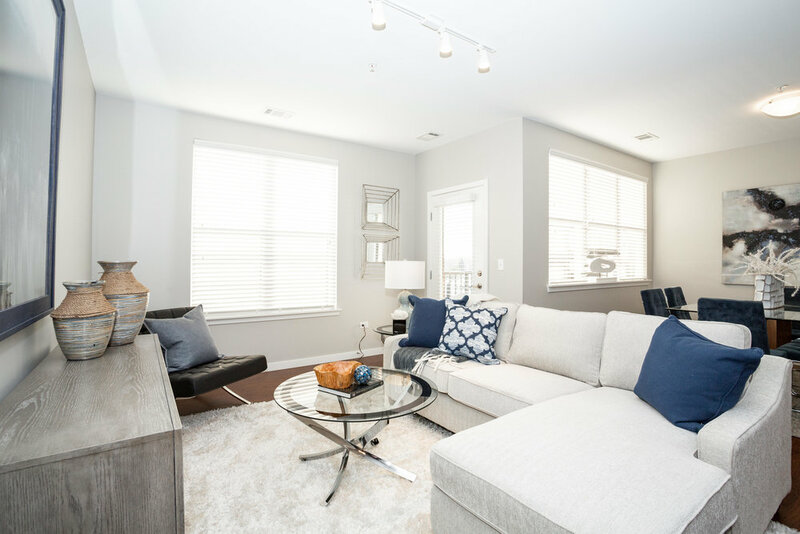 Unit A's have 2 bedrooms, 2 baths and are approximately 1,300 square feet. Rental prices start at $2,695 per month. * Rental prices and amenities are subject to change. This is the apartment you've always wanted. Get ready for modern, luxury living with large open floor plans ideal for entertaining, and custom upscale interior finishes in every room. Nine-foot ceilings and large windows that welcome lots of natural light and faux wood floors in living areas. Washers and dryers in every unit. Central, individually controlled heat and AC. Private outdoor balconies with outstanding views of the neighborhood. Gourmet kitchens with eat-in islands, custom quartz countertops, subway tile backsplash, and one-bowl stainless steel sink with garbage disposal. Furniture-quality shaker style cabinetry in white or expresso finishes with 42-inch upper cabinets, perfect for extra storage. GE stainless steel appliances and built-in microwave. Modern shaker style vanity cabinets with quartz countertops. Stand alone showers with glass doors in select units. Large master bedrooms with spacious walk-in closets in select units. 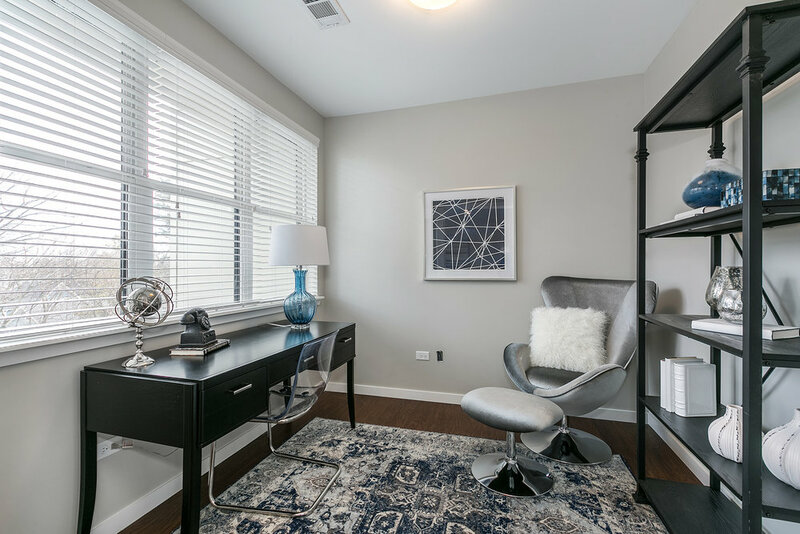 Versatile den or home office space in all one bedroom units. USB charging ports in kitchen and master bedroom. Everything you would want in a community. Featuring 39 luxury apartment homes in a brick four-story building with an indoor heated garage on the ground level. Timeless brick exteriors surrounded by professional landscaping. Walk into an elegant lobby with controlled key card access to all entrances. Fitness center featuring health-club quality equipment. Smoke-free building with a community room available for reservations. Bike storage and limited storage available. Dedicated room for Luxer Package Delivery System. Trash chutes on every floor. There's no place like Naperville. 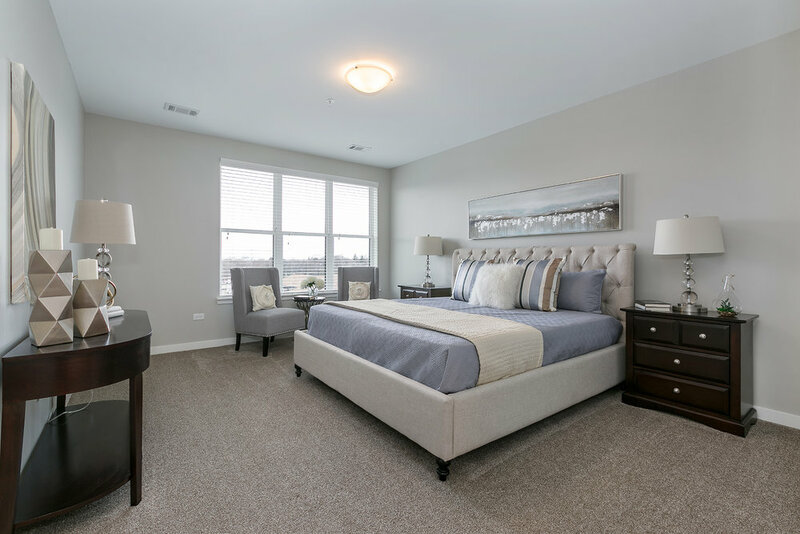 Whether you're moving from the city, a nearby suburb or out of state you'll find everything you need and the comforts of home in Naperville. The vibrant downtown, historic district, excellent schools, endless supply of shops, restaurants and bars, walkability and energy of Naperville will captivate you. Living at Ellsworth Station will put you in the heart of it all. 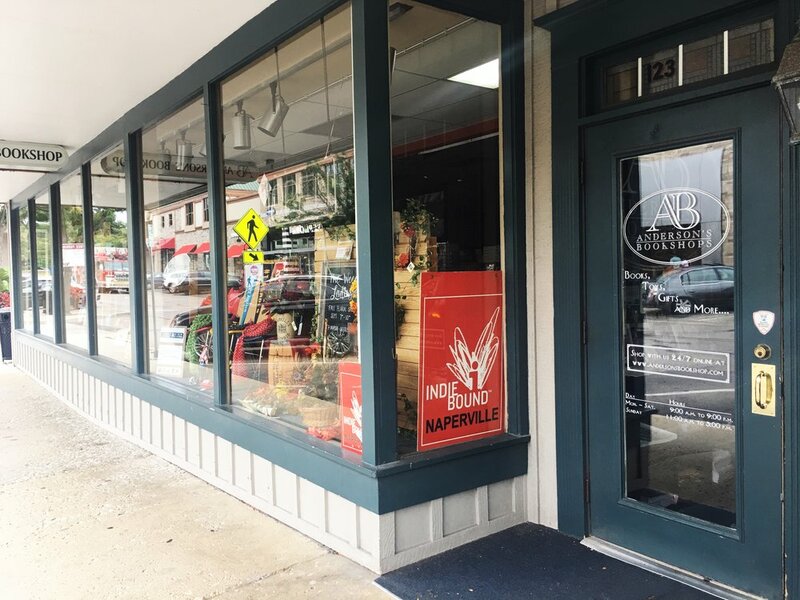 Check out everything downtown Naperville has to offer. Click here for a bigger version of this map.